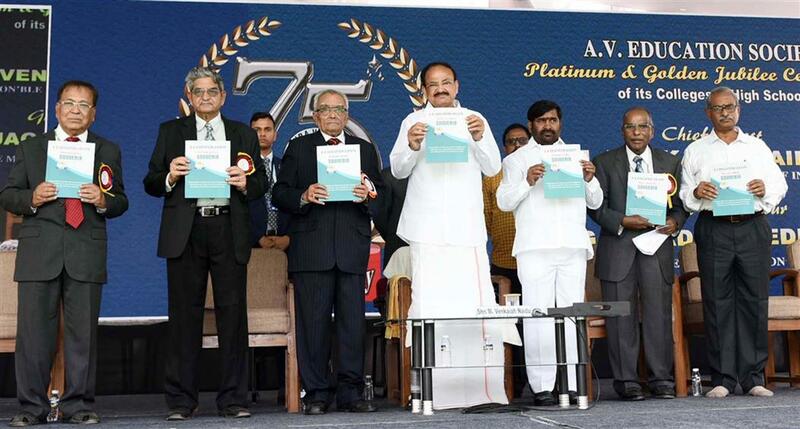 Hyderabad: The Vice President of India, Shri M. Venkaiah Naidu has said that the education we impart in our schools, colleges and universities must lead to self discovery, enlightenment and awakening of an individual. He was addressing the gathering at the Platinum Jubilee Celebrations of Andhra Vidyalaya College of Arts, Science & Commerce, in Hyderabad today. The Minister for Education, Telangana, Shri G. Jagdish Reddy and other dignitaries were present on the occasion. The Vice President said that by 2020, the median age in India will be just 28, compared to 37 in China and the US, 45 in Western Europe, and 49 in Japan. Demographics is a game changer in economic development and can transform the pace and pattern of economic growth, he added. Shri Naidu said that investing in people through healthcare, quality education, jobs and skills helps build human capital. He further said that though India has made considerable gains in human development, it still grapples from challenges of illiteracy, big barriers to secondary schooling, low-quality public services, and gender discrimination. It is time for India to pursue a much more aggressive education plan, exploiting the new technology opportunities, he added. The Vice President said that there should be renewed focus on gender equality and safety of women through gender sensitization and gender sensitization must begin at the home, schools and colleges. He urged the institution to do everything in its power to encourage more and more young women to avail opportunities of higher education. Saying that even when jobs are available, candidates with the right skill set that fit the job are not available, the Vice President suggested to tackle this issue with the Pradhan Mantri Kaushal Vikas Yojna 2.0 which has been launched in October 2016 and aims to train 10 Million Youth over a period of 4 years. Advising to pay attention to equity in access to education, the Vice President said that women and girls, Scheduled Castes and Tribes, differently-abled and minority groups need to have a barrier free and equitable access to higher education. Quoting Swami Vivekananda’s exhortation a hundred years ago – “Awake, arise and stop not till your goal is reached”, Shri Naidu said that this world is full of opportunities and one must seize them. “I am delighted to participate in the Platinum Jubilee Celebrations of Andhra Vidyalaya College of Arts, Science & Commerce, in Hyderabad today. Completion of 70 years is an important milestone in the journey of any institution. This journey of seven decades stands testament to the institution’s unwavering commitment to the cause of providing quality education. I was informed that the A.V. Education Society was established in the year 1944, with an objective of extending educational opportunities to backward sections of the region. The society started A. V. College in 1968 to provide Under Graduate education to students in the region and later expanded to provide Post Graduate education. In the last seven decades, the institution has produced many eminent Indians who have been doing great service to this country. It is noteworthy that many of its alumni are holding top positions in a number of organizations in India and abroad. I am happy to know that Justice Subhash Reddy, Judge of the High Court of A.P; Capt. K. Usha, first woman Army Officer; Pullela Gopi Chand, National Coach, Badminton; Gagan Narang, Olympian and Champion Shooter and several other achievers and successful professionals are alumni of this great institution. It is heartening to note that in its vision statement, the institution envisages the empowerment of individuals through the pursuit of excellence. India is blessed with a huge demographic capital. By 2020, the median age in India will be just 28, compared to 37 in China and the US, 45 in Western Europe, and 49 in Japan. Demographics is a game changer in economic development and can transform the pace and pattern of economic growth. I believe that it is this energetic, inventive and enterprising youth population that will write India’s glorious story of prosperity. But a lot depends upon whether the bulge in working population can be properly educated and trained. India has to create enough jobs to employ the 10 million more people who are set to join the labor force every year. India has to invest more and more efficiently in people. Human capital is already the largest component of global wealth and one of the most crucial and fast growing components of India’s wealth. Many international agencies including the World Bank believe that India really has the potential to become the human resource capital of the world. Though India has made considerable gains in human development, it still grapples from challenges of illiteracy, big barriers to secondary schooling, low-quality public services, and gender discrimination. The Government of India has undertaken a number of proactive initiatives for the betterment of Higher Education in India. From the SWAYAM Prabha programme which takes high quality educational content to the most backward areas using satellite communication through 32 DTH channels to the National Digital Library (NDL) which is a virtual repository of learning resources, a number of innovative initiatives now define India’s Higher Education potential. Government has also embarked upon a mission to build several “Institutions of Eminence” (IoE) in public and private domain, so that they are rated among the best global institutions, propelling India to the status of being a favored destination to the world for Higher Education. We have also come up with a number of encouraging, out of the box ideas such as the Smart India Hackathon initiative that promotes innovation to find solutions for common problems faced by the society at large. It is time for India to pursue a much more aggressive education plan, exploiting the new technology opportunities including Massive Open Online Courses and virtual classrooms to the best possible extent. No country can achieve its potential and meet the daunting challenges of the 21st century without the full participation of working population, both women and men. Discrimination against women have a crippling impact on economic development. There should be renewed focus on gender equality and safety of women through gender sensitization. Gender sensitization must begin at the home, schools and colleges. I urge this institution to do everything in its power to encourage more and more young women to avail opportunities of higher education. It is time that we reassess and re-evaluate our approach and our strategy towards higher education. While we have considerably expanded our education system and more young people are in schools and colleges than ever before, there is clearly a crisis of quality. The learning attainment surveys speak of significant learning gaps. While India is home to a few world-class institutes that cater to higher education there are a large number of mediocre institutions that operate in our country. A massive ranking exercise, the National Institutional Ranking Framework (NIRF) was launched in 2015 for various categories of institutions such as Universities, Engineering colleges, Management Institutions etc. It is a decisive step in the direction of ushering in accountability and transparency in the higher educational institutions of India. Besides unemployment, India also faces a problem of unemployability. Even when jobs are available, candidates with the right skill set that fit the job are not available. To tackle this issue, the Pradhan Mantri Kaushal Vikas Yojna 2.0 has been launched in October 2016. It aims to train 10 Million Youth over a period of 4 years. Since its launch, it has trained and certified over 3.5 million young people. It is high time that we focus on vocational education in schools in addition with improving learning outcomes in reading, writing and basic Mathematics. The quality of education both in terms of the curriculum and teaching methodology also needs to be redefined and refined. We need to ensure that our youth are ready for the job market. We also need to equip them with the entrepreneurial skills to become job creators. We have to fully exploit the limitless possibilities of the digital revolution we are experiencing now to fortify our higher education. We must prepare our youngsters to ride this wave of technology and to harness its potential to the best possible extent. We also need to pay attention to equity in access to education. 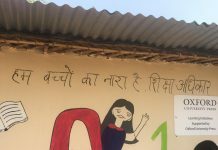 Women and girls, Scheduled Castes and Tribes, differently-abled and minority groups need to have a barrier free and equitable access to higher education. India is firmly committed to the ideals social justice and equitable opportunities to education become a crucial first step towards achieving social democracy. For our higher Educational Institutions to become centres of global excellence, we must constantly strive to promote autonomy and quality and create an enabling environment for educational institutions to chart their own paths to excellence. We must build meaningful collaborations with the best educational institutions from around the globe and seek to learn and adapt the best practices followed by them in teaching, research and curriculum to suit our needs. We have already launched the Global Initiative of Academic Networks (GIAN) an initiative to provide opportunities for Indian students & faculty to interact with the best academic and industry experts from around the world. Many more such partnerships have to be nurtured and fostered. We also have to invest significant amount of resources in training teachers to make them highly competent. Our education sector is facing new challenges and we need teachers who are capable of rising to the occasion to effectively tackle these tests. While I agree that education should lead to employment and livelihood security, I do not believe that a job is the ultimate aim of education. We must ensure that the education we impart in our schools, colleges and universities leads to self discovery, enlightenment and awakening of an individual. Education must empower the student in a holistic manner by ensuring all-round development of his/ her personality. Education must build a strong character, inculcate ethical and moral values and also impart essential life skills, apart from leadership qualities. Education should bring out the best in man and lead to his enlightenment and empowerment. It is an instrument for socio-economic transformation. Education is the process of continuous, lifelong learning and does not end with the acquisition of a degree. Always aim and strive to achieve excellence in your chosen domain. Never get demoralized by temporary setbacks as every experience teaches a new lesson in life. Maintain equanimity in all situations, be confident but not arrogant. This world is full of opportunities. You must seize them. As Swami Vivekananda exhorted a hundred years ago- “Awake, arise and stop not till your goal is reached”. I hope that AV College is successful in its quest to provide quality education. I urge you to do your best to mould global citizens who are well equipped to deal with any challenge that the competitive, fast paced world of the 21st century throws their way. I wish each and every one of you the very best in your future endeavours.